You remember the story of Rip Van Winkle, don't you? In the years before the American Revolution, a man falls asleep for some twenty years, and awakens to a new world. Have you ever imagined what it might be like for a miner to have a similar experience, waking up to find highsec transformed by our own revolution? Now's our chance to find out. I received an EVEmail from Smokey Sevier, who shared a remarkable tale. Smokey was a resident of Halaima in the years before the advent of the New Order. Luckily, he stuck around long enough to witness the dawn of a new era. Now is where the story gets interesting. Smokey had to leave EVE for whatever reason, just as the New Order was coming into existence. In those days, I would often tell the miners of Halaima that I intended to bring my vision to all empire space, and that one day every man, woman, and child in highsec would recognize me as their leader. Many miners expressed skepticism, since I was just a guy who bumped miners out of the local ice field. Just recently, perhaps a bit over a year later, our own Bump Van Winkle returned to EVE. He was curious whether James 315 was still around, and was amazed and delighted by what had occurred during his slumber. What a privilege to witness the striking before-and-after picture of highsec! ...and yet, the greater blessing belongs to those who worked as Agents all along our path to victory. Still, a wonderful and inspiring story. It leaves me with a question, though: What will miners say when they see what the New Order has managed to accomplish in two, five, or even ten years? i teared up a little bit, i swear i did! 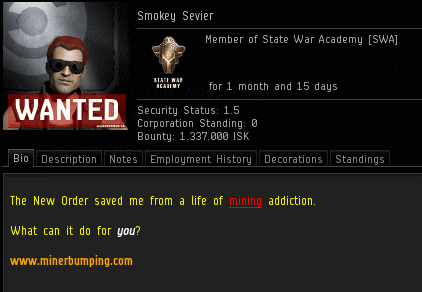 Smokey Sevier, masterfully written evemail! I actually teared up at that, Great Bio too. When we defend The Code we are all James' alts. That is the beauty of The Code. I wanna be James' alt too! But, we still haven't heard about Erotica's sleezy pics and why he withdrew his application for CSM, is this not more newsworthy, or is there a little bias? Obviously you're more than a little biased, or you'd have told us why he withdrew already.